In one of the borough’s most exciting art installation projects in recent memory, this weekend’s Bronx River Art Center’s (BRAC) River Rising/Sube El Rio exposition of science art, and technology in Starlight Park is ready to go. Featuring eight brilliant art sculptures, each inbred with innovative technology, River Rising/Sube El Rio is an extended hand to the Bronx International Exposition of Science, Arts, and Industries that was held on the very same Starlight Park grounds a hundred years ago. Part of the Bronx River Greenway, Starlight Park is hard by the Bronx River and extends under the 174th Street Bridge. But because it’s somewhat isolated from residential areas, there hasn’t been any real activities on the park’s lush grounds…. until now. ThisistheBronX TV went on Facebook LIVE on Wednesday to examine the art installations that will be part of ‘River Rising/Sube el Rio’ at Starlight Park in the Bronx. So they set about inviting innovative designs and artists and this Saturday, the park will be open to the public from 12:00pm – 9:00pm. Papo Vasquez Mighty Pirates Troubadours will perform at 6:30pm and on Sunday Arthur Aviles Typlical Theater and Friends will perform at 12:00pm. If you can’t make the opening weekend, no matter. The installation will be open in Starlight Park for a year. 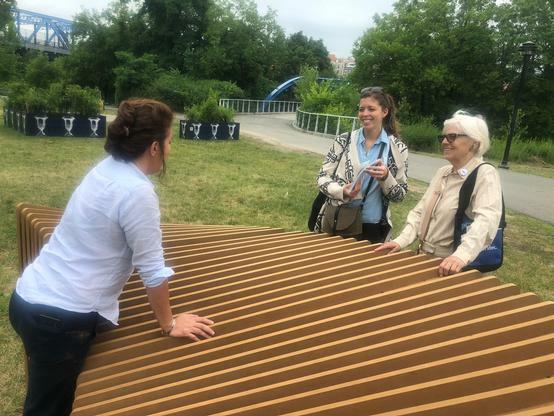 The Project is produced by Gail Nathan and Laura James and the site curators are KaN Landscape Design, Karine Duteil, and Nadej Hocini. River Rising/Sube el Rio is made possible in part by the Lincoln Center Cultural Innovation Fund, which is generously supported by The Rockefeller Foundation and administered by Lincoln Center. River Rising/Sube el Rio is produced in conjunction with KaN Landscape Architects and Bronx River Alliance, in partnership with NYC Parks.